Recent additions to the Antique Cufflink Gallery include mesmerizing moss agate cufflinks from the venerable Richardson workshop, striking Art Deco cufflinks created by Jacob Hookaylo and elegant laurel wreath cufflinks from the early 1900s. In the Antique Dress Set Gallery recent additions include a full dress set creature by Sansbury & Nellis with vibrant citrines set in gold. Recent additions to the Antique Cufflink Gallery include striking amethyst cufflinks created by Hans Brassler, a golden bit of architectural history, an elegant Carrington moonstone and platinum full dress set, an equally elegant Tiffany abalone and platinum dress set and smoldering tiger eye cufflinks by Sansbury & Nellis. 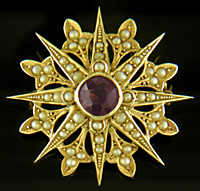 New in the Antique Brooch Gallery is a striking amethyst and pearl brooch with radiating fleur-de-lys. Recent additions to the Antique Cufflink Gallery include elegant Art Deco cufflinks set with diamonds, Keller golden honeycomb cufflinks and striking yellow and white gold cufflinks created by J.R. Wood. New in the Antique Stickpin Gallery are two zoomorphic, gem-set stickpins created by Hans Brassler. Recent additions to the Antique Cufflink Gallery include beautifully engraved Carrington platinum and gold cufflinks with blue enamel borders, inescapably elegant two-tone cufflinks from Lebolt & Company, and striking midcentury Garrigus cufflinks set with sapphire cabochons. 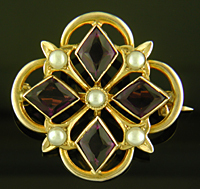 New in the Antique Brooch and Pin Gallery are a dramatic Art Nouveau brooch set with three pearls and an elegant black and gold bar pin from Carter, Howe. Recent additions to the Antique Cufflink Gallery include Carrington platinum and gold cufflinks set with mother of pearl, an enigmatic pair with a message of restrained love, and elegant Art Deco cufflinks with an engraved "A". New in the Antique Stickpin Gallery are two elegant examples of Hans Brassler's work - one set with carnelian the other lapis lazuli. Recent additions to the Antique Cufflink Gallery include an elegant Carrington onyx and pearl full dress set, sculptural Victorian cufflinks with dragons and turquoise, a pair of amethyst and gold cufflinks from Carrington and, last but not least, a striking tuxedo set with smoldering red carnelians. New to the Antique Stickpin Gallery are a mysterious woman in a cloak set with a small diamond and a Hans Brassler concentric stickpin with a bright peridot. Recent additions to the Antique Cufflink Gallery include jazzy Art Deco cufflinks, elegant Carrington sapphires and diamonds, a striking onyx and pearl dress set, frosty white snowflakes and a bold pair of geometric onyx cufflinks. 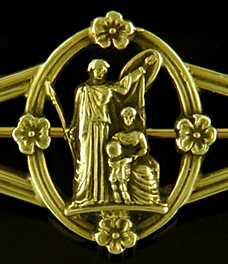 In the Antique Brooch Gallery we recently added an intriguing Renaissance Revival pin from Tiffany & Company. I hope everyone enjoyed the best of the holiday season and is looking to a prosperous and healthy new year. To get the new year off to a good start, recent additions to the Antique Jewelry Galleries include Art Moderne hematite cufflinks, a radiant star brooch by Hans Brassler, and a menacing lion with fiery eyes.